Surely if there was a “Land of Chocolate”, Germany would be it (insert mental image from The Simpsons episode where Homer frolics around an imaginary German land made entirely out of chocolate here). Chocolate appears everywhere in Germany, bright, alluring packets lining the aisles of supermarkets, corner stores and delis. And my goodness, is it devoured – on buses, on the tube, biking down the road whilst talking on the phone, hiking in the hills – it seems it’s always a good time for a wee stück of chocolatey goodness. Germany is one of the highest consumers of chocolate in the world and it is heavily engrained in German culture. It is also widely known that some kids grow up thinking that cows are actually purple after years of exposure to the purple Milka Chocolate cow. In actual fact, the average German will eat around 11 kilograms of chocolate a year – meine Gute, that’s a whole lotta chocolate. Chocolate has received a great deal of press in the past few years as research has unfolded just how high the levels of antioxidants are in cocoa, which you can read about in my recipe for chocolate spice bliss balls. However, if you would like to go one step higher on the superfood-o-meter, raw cacao is the crème de la crème. Raw cacao is one of the most beneficial superfoods that you can eat, it’s the cacao bean in it’s purest, most wunderbar form, containing iron, calcium, fibre, potassium and zinc. Raw cacao is high in antioxidant flavanoids, which can help improve circulation and blood pressure. It also contains high levels of magnesium, which is one of the most effective minerals to combat stress, as well as building strong teeth and bones. Raw cacao also promotes the release of neurotransmitters, which in turn release hormones that make you feel pretty fine and dandy. One of these neurotransmitters, serotonin, can aid in reducing depression and combating PMS symptoms – what a superfood wunderkind! The bonus is that by making your own chocolatey treats, you have absolute control over what you are putting into your mouths and can keep it as pure and unrefined as it was originally intended. Chocolate mousse often conjures up thoughts of über-decadence, a bloated stomach and the goddess of all things domestic, Nigella Lawson. In a typical chocolate mousse recipe, the main ingredients are cream, sugar and chocolate, which is such a feisty combination that it’s no wonder you feel like a nap afterwards. However, with this chocolate avocado mousse, you get maximal health benefits with an intense chocolatey hit, without the post-dessert-too-much-dairy slump. It’s sugar-free, dairy-free, gluten-free, vegan (when using agave) and can also be raw, providing raw honey or agave is used and that the almonds are kept in their natural state. This dessert is also textural sensation – the tart raspberries, mixed with with the creamy chocolate mousse and lightly-spiced candied almonds is a superfoodie winner. Do it do it. Spoon the avocado into a bowl, blender or food processor*. Add the raw cacao powder, softened coconut oil, raw honey or agave, milk, vanilla and salt. Mix until smooth. In a bowl, lightly mash about half of the raspberries with a fork. 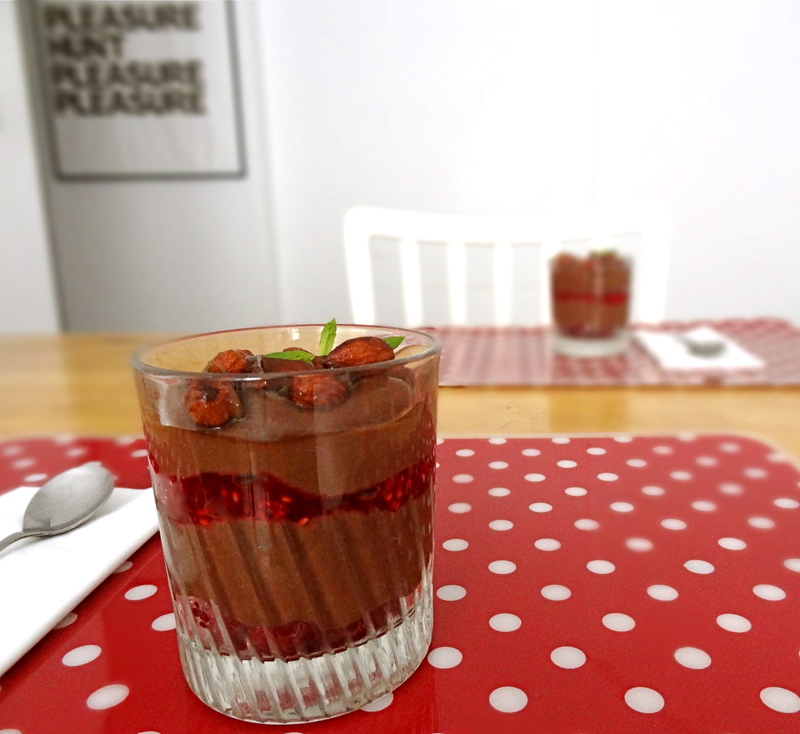 Layer into small glasses, alternating the mousse with the mashed raspberries and the whole raspberries as you like. Allow to cool in the fridge for at least 30 minutes before serving. Toast the almonds for a few minutes in small frying pan until lightly crunchy. Add the coconut oil and toss around in the pan for another couple of minutes. Add the honey and keep the almonds moving around the pan until a light caramel color is reached. Take off the heat, add the cinnamon and stir well. Transfer to baking paper and allow caramel to set. Once hardened, break up the candied almonds, sprinkle over the mousse, garnish with mint and serve. * If you don’t have a food processor or blender, use a whisk and watch your guns grow. I’m so impressed you can make an avocado look so good. Does it impair the flavour of the cocoa or is it used for texture? The avocado makes it super creamy and rich. There is a mild aftertaste from the avocado, but what you get is the full cacao hit!